Cats are both inquisitive and territorial; unfortunately these two traits can combine at inopportune moments, resulting in injuries. When a cat's vision is injured beyond repair or the eye becomes infected, a vet may elect to perform enucleation, where the eyeball is removed and the lid permanently sutured closed. Caring for a cat after enucleation requires strict attention to your vet's instructions and careful, constant observation of your cat. Listen to your veterinarian's instructions, and write down any specific information, such as medication dosages, dressing changes or feeding schedules. Your cat's reaction to the anesthesia and surgery will dictate parts of the aftercare process. Monitor the sutured area for any swelling or discharge. It is normal for there to be some sneezing and bloody discharge in the first two to four days after the surgery. Your cat likely will be wearing an Elizabethan collar to prevent her from scratching the sutured area; remember to check this collar for tightness and to make sure it is not becoming uncomfortable. Keep an eye on your cat's behavior. While he may be groggy and listless as the anesthesia wears off, he should retain an interest in food and water. If your cat refuses food and water or seems to be acting unusual or lethargic, contact your veterinarian. Continue to give any antibiotics or topical medication recommended by your veterinarian, paying attention to the dosing schedule and instructions. This will prevent infection at the surgery site. 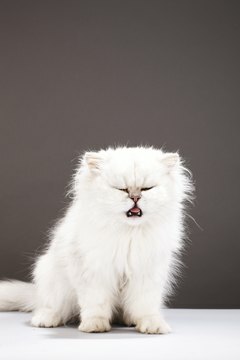 Your cat's hair and whiskers may take six to eight weeks or more to grow back at the surgery site.